It’s been a while not having steamed prawns. This is a simple and homey dish I tried in Hong Kong. I miss it so much. This dish is so simple, quick to make and very delicious. The key is to get fresh prawns. Yes, not those have been frozen for quite a long time. You’ll be amazed how tasty the prawns are after steaming. 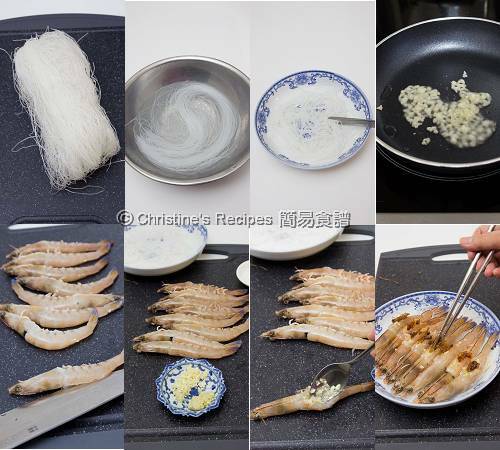 When I made this dish, I placed the prawns on a bed of vermicelli. Thus I didn’t even waste a drop of the tasty sauce released from the prawns after steaming. All goodies were absorbed by the vermicelli. From top left: dried vermicelli, soaked vermicelli. Rinse the prawns and pat dry. Use a pair of scissors to cut the shells along the back of the prawns as it will help cut the flesh much easier. Then use a knife to make an incision by cutting the flesh about three-quarters of the way into prawn flesh, from the head to nearly all the way down to the tail. Remove the vein. Open the flesh and slightly press to flatten. Drain vermicelli well. Put on a serving plate. Use a pair of scissors to cut a few times. Heat oil in a wok over low-medium heat. Briefly pan fry the garlic until fragrant. Don’t burn it anyway. 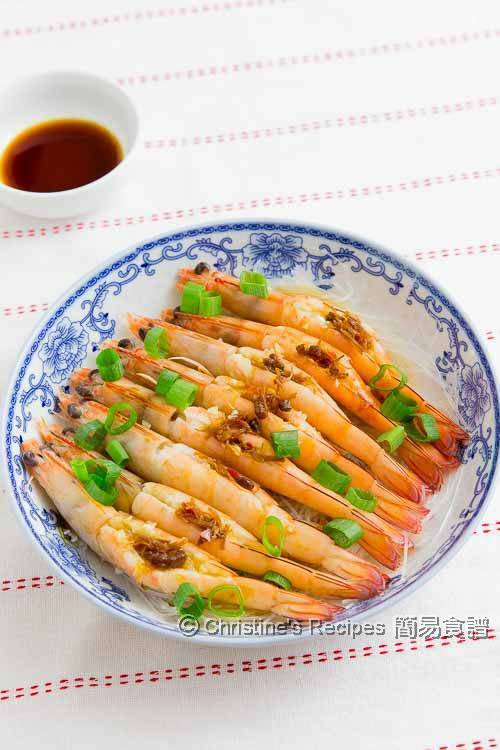 Spoon garlic and XO sauce evenly onto the incision of each prawn. Arrange prawns on the vermicelli. Steam in a wok over high heat for about 7 to 8 minutes, until the prawns turn into bright orange in colour. Garnish with diced spring onion. Serve hot with soy sauce if desired. By pan-frying, the strong pungent taste of garlic will be decreased. It will bring up a fragrant smell instead. The steaming time depends on the size of your prawns. Adjust accordingly. You cook seriously as good as a pro, Christine. 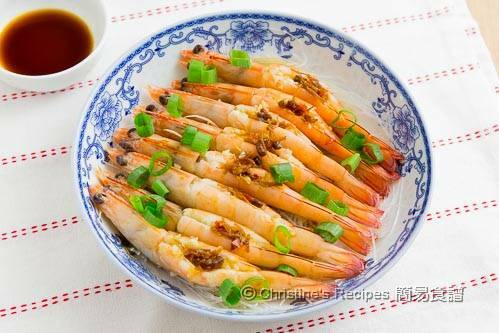 These steamed prawns look droolworthy.